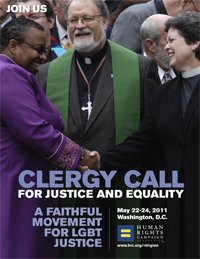 Washington, D.C. – The largest delegation of fair-minded Texas faith leaders since the conception of LGBT rights are on their way to the Nation’s Capitol to participate in the third Human Rights Campaign’s Clergy Call for Justice and Equality, May 22 – 24. Twenty-two clergy, theologians, and seminarians from across the Lone Star State are registered for this year’s lobbying effort on Capitol Hill. The Human Rights Campaign Religion and Faith Program mobilizes people of faith to advocate for lesbian, gay, bisexual and transgender people every other year, and among the important items on the agenda will be the full implementation of the Repeal of Don’t Ask, Don’t Tell (DADT), the repeal of the Defense of Marriage Act (DOMA), anti-bullying efforts across the nation (such as the one just passed by the Texas House, strengthening the penalties for harassment and bullying in public schools), and the status of the Dream Act. Texans have a particularly tall order as grassroots citizen lobbyists, since both U.S. Senators, Kay Bailey Hutchison and John Cornyn, have consistently voted against human rights initiatives during their legislative careers in Washington. At the core of the Texas delegation are fifteen students, faculty, and alumni of Brite Divinity School in Fort Worth, the largest from any seminary or divinity school in the state. Brite, founded in 1914 by an endowment from Marfa rancher Luke Brite, is located on the campus of Texas Christian University. In former years, Brite was conservative on the issue of LGBTQ-inclusion, but now is the only accredited institution of theological higher education in Texas to extend welcome status to lesbians, gay men, bisexuals, and transgender persons by action of its board of trustees. Among the faculty are two openly gay and lesbian professors, and the number of LGBTQ students in the Fort Worth school is growing. “Students are learning how to take a stand for justice by becoming clergy for whom all people matter, and are eager to work for equality in public forums like Clergy Call. Our students are taking their roles as public theologians seriously,” said Dr. Stephen V. Sprinkle, Associate Professor of Practical Theology at the Divinity School, and Theologian in Residence at the Cathedral of Hope in Dallas. “Each of the students who have traveled to Washington chose voluntarily to participate in Clergy Call because they believe faith calls them to be here.” Billed as the largest interfaith gathering of LGBTQ and Allied Clergy and Faith Leaders in the United States, Clergy Call will bring representatives of faith communities from all fifty states to the capitol for training in faith messaging, skill-building for advocacy with legislators, interfaith worship, and person-to-person lobbying of senators and congresspeople. This year’s headline speakers include Rabbi Denise Egger, Rev. Harry Knox, Bishop Gene Robinson, Bishop Yvette Flunder, Rabbi David Saperstein, Rev. Nancy Wilson, and Bishop Carlton Pearson. Dr. Sharon Groves is the Director of the HRC Religion and Faith Program, based in Washington, D.C.
May 22, 2011 - Posted by	unfinishedlives | African Americans, Anglo Americans, Asian Americans, Bisexual persons, Brite Divinity School, Bullying in schools, Cathedral of Hope, Clergy Call, DOMA, Don't Ask Don't Tell (DADT), Dream Act, gay men, gender identity/expression, GLBTQ, hate crimes prevention, Homosexuality and the Bible, Human Rights Campaign, Human Rights Campaign Religion and Faith Program, Latino and Latina Americans, Legislation, Lesbian women, LGBT teen suicide prevention, LGBTQ, Marriage Equality, Media Issues, military, Military Chaplaincy, Politics, Public Theology, Queer, Social Justice Advocacy, Texas, transgender persons, Washington, D.C.	| African Americans, Anglo Americans, Asian Americans, Bisexual persons, Brite Divinity School, Bullying in schools, Clergy Call, Defense of Marriage Act (DOMA), Don't Ask Don't Tell (DADT), Dream Act, gay men, gay teens, GLBTQ, hate crimes prevention, Human Rights Campaign, Human Rights Campaign Religion and Faith Program, Latino / Latina Americans, Lesbians, LGBT teen suicide, LGBTQ, LGBTQ teen suicide, Marriage Equality, Media Issues, military, Politics, Social Justice Advocacy, Texas, transgender persons, Washington D.C.